Freddy Kruger has a new set of figures based on the movie, Nightmare on Elm Street. “Powerglove Freddy” complete with brand new head sculpt, powerglove right arm and removable hat. Also from Freddy’s Dead, we have “Fred Krueger: The Springwood Slasher” featuring the likeness of actor Robert Englund as he appeared as Freddy before the burns. Presented in his human form with photo realistic portrait, gloved right hand, unburned left hand, and removable hat. This is how Freddy looked before he became the monster that haunts your dreams. Based on Chloe Grace Moretz’ take on the character in the Carrie remake, these new NECA figures are a terrifying preview of what we can expect to see when the movie is finally released in October of this year. You can get the 6-inch figure of Carrie in full-on Rage mode, or you can get her more innocent look, without all the blood. If you can’t decide, grab ’em both as a set. To get in the spirit, check out NECA’s awesome CULT CLASSICS line. Everyone from Michael Myers (above) to Hannibal Lecter, The Crow to Shaun of the Dead can be found in this growing collection and they all look just brilliant. Check ’em out and have a happy Halloween! Cult classic villain FREDDY KRUEGER’s presence returns to the NECA collection with a brand new prop furnace based on the one in the film. It’s an item fans have clamoured for for ages and now it’s finally on it way to join your Freddy figures. The furnace is in scale with the figures in the collection and features an LED-lit flame and a hinged door. A must-have if you’re planning your horror movie display or diorama. Nightmare on Elm Street might have been a big success, but the continuation of the franchise and its strange popularity have allowed it to fall comfortably into the “cult classic” zone. And we’ve got two new figures that only serve as a reminder of what this has become. 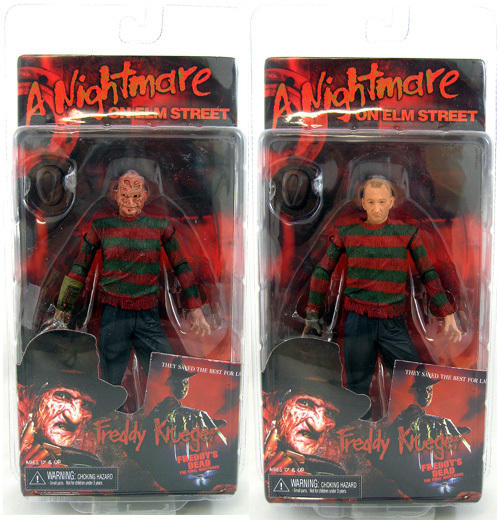 You’ve got 2 choices of Freddy Krueger right here: Dream Warriors Freddy (including a teeny tiny Elm Street house) and Dream Master Freddy, featuring a number of parts from the bodies of his victims–charming, isn’t he? They’re made by Neca so you can expect some amazing sculpting and great design, plus a post that’s perfectly display-friendly.